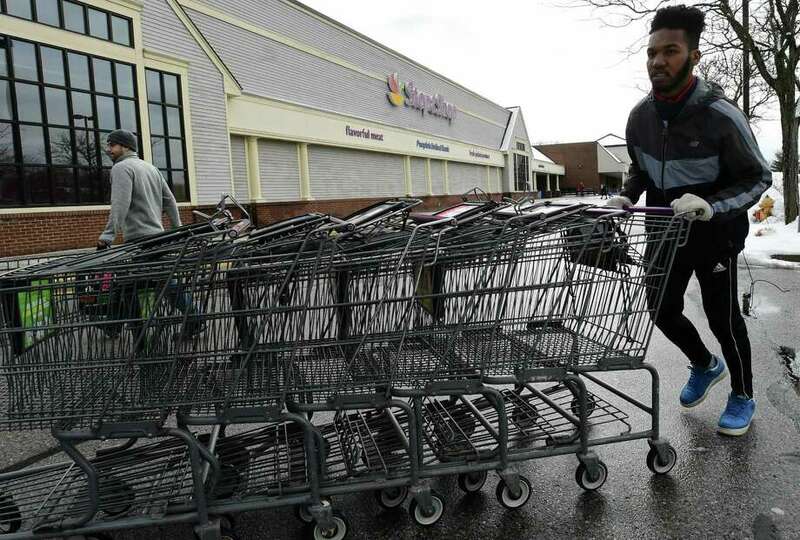 Employees of Stop and Shop gather carts in the parking lot in March on Main Avenue in Norwalk. In an attempt to reach a resolution this week of a protracted contract negotiation for unionized workers in New England, Stop & Shop is offering long-tenured workers buyouts that could amount to as much as $75,000 — if a deal is struck by Wednesday. On Monday, Stop & Shop released publicly for the first time specifics on its contract proposal to workers throughout Connecticut and southern New England, in advance of negotiations resuming on Tuesday in Providence, R.I. Weeks have passed since members of the United Food & Commercial Workers union authorized their leaders to call a strike in the event of an impasse. In any such event, as many as 31,000 unionized workers could fold their aprons and walk away from checkout lanes, food counters and other store departments onto picket lines; with the possibility of additional disruptions should Teamsters members cease warehouse and delivery work in support of their counterparts. 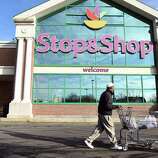 Stop & Shop plans to hire temporary workers and staff departments with managers should a strike occur. On Monday, the company released its latest offers as of April 5 for five unions that have threatened a work stoppage, including for the Westport-based Local 371 affiliate of UFCW and Local 919 in Farmington. Members would be eligible for the buyout if they had at least 25 years with the Stop & Shop on a full-time basis. Stop & Shop would cap the voluntary buyouts at 30 percent of the membership of any single union affiliate, without stating how many people could be eligible but stating if fewer than 180 applied it would not move forward with the plan. Eligible members would have two weeks to decide if they wanted to take the buyout. Stop & Shop says it is “virtually alone” among New England supermarket chains in offering a defined pension plan, versus 401k retirement savings plans that are more the norm. On Saturday, the Local 371 affiliate of UFCW described as “slight progress” from the union vantage of the ongoing negotiations, while calling out a few specifics union leadership deems unreasonable, including Stop & Shop’s goal to eliminate time-and-a-half overtime pay for some workers on Sundays. Due to a reporting error, a previous version stated incorrectly Stop and Shop is in negotiations with 10 UFCW unions. The company is negotiating with five. Updated to reflect UFCW statement in response to buyout offer.